Michigan State tried a fake FG down by three with just more than five minutes remaining on a 4th-and-6 play. Although it wasn’t successful, CAI liked the concept. Had this play worked, underdog Michigan State could have been playing the final minutes with a four-point lead. Later, the Spartans had 4th-and-10 from their -36, with 1:51 remaining in the game and all three timeouts remaining and punted. The Spartans did get the ball back following a three-and-out on their own -24 and drove 76 yards for the winning score in the final moments. Though it did work out, this was a long shot for the Spartans. Had Penn State achieved a single first down, the game would have been over. Also, had MSU gone for it and missed, the Spartans still would have had the same opportunity to get the ball back, although probably in worse field position. Considering the field position they got after the punt was the -24, they might not have lost all that much ground with a miss. Punting gave Michigan State only one pathway to victory, but give the Spartans all the credit for making that path work. For the Michigan State fake FG, start at 16:08. For the MSU punt with 1:51 left in the game, start at 17:30. For the MSU game-winning drive and TD, start at 18:04. For the final play of the game by Penn State, start at 19:43. Middle Tennessee State, leading 31-17 with less than 8:00 to play, had 1st-and-10 at the Marshall 10. On first down, the Blue Raiders lost 2 yards, followed by an incomplete pass, a run to the +1, and then an 18-yard FG to go up 34-17. Leading by 14 in the middle of the fourth quarter, the offense needed to get any type of score to go up three scores and run clock. First-and-goal from the +10 is the most challenging set of downs in football to get another first down or a TD. Particularly following the loss of two yards on first down, MTSU’s goal should have been to avoid a turnover, run some clock, and leave itself in great position to kick that FG. The second-down incomplete pass risked a turnover and the clock stopping. The third-down rush was a great idea and nearly went for the score. CAI rarely recommends an 18-yard field goal, but this was a rare exception. Either a FG or a TD would have provided a three-score lead, and Marshall was unlikely to get three possessions in the time remaining. So, taking any sort of a risk on fourth down was unnecessary when a made FG was almost assured. For the MTSU FG, start on 3rd-and-goal with 7:15 left in the game at 17:03. Ole Miss kicked the dreaded 17-yard FG on the last play of the first half, trailing 28-3. The 17-yard FG is almost always a bad choice, and when trailing by 25 in the second quarter, a TD was sorely needed. For the Ole Miss 17-yard FG start at 8:40. Oklahoma survived Army in a game that ended 21-21 in regulation and was dominated by both offenses. Army, coming in as a four-TD underdog, wanted to minimize the possessions in this game to provide fewer opportunities for the Sooners to assert their dominance. The Black Knights succeeded in grinding out first downs, aided by a 4-for-4 performance on fourth downs, and took a staggering 44:41 off the clock in their six full offensive possessions. Oklahoma had an excellent chance to win in regulation and probably could have scored a TD, but the Sooners took their time before losing 6 yards to center the ball and missing a 33-yard FG to send the game into OT. There were two issues with this situation. First, losing the 6 yards made for a more challenging kick. Secondly, Army does not have a quick-strike offense. Had Oklahoma scored with 15-20 seconds remaining, there would have been little hope for Army to come back to tie. Continuing on and trying to score, or at least getting the equivalent of an XP distance FG for the win, was the play for Oklahoma. For the Oklahoma centering play, start at 1:37:40. For the missed Oklahoma FG, start at 1:39:10. LSU got the ball to the Auburn 24 with 1:14 to play and Auburn with one timeout remaining. LSU ran the ball three times for no yards, used up the remaining time and the final Auburn timeout, and kicked a 41-yard FG on the final play. This was the right idea. The three runs didn’t gain any yardage, but they ultimately didn’t lose yardage either, and they ate up the clock. Had LSU thrown incomplete or gone out of bounds, Auburn would have had time for a final drive—and Auburn has an excellent kicker. LSU was also wise to try to gain positive yardage for its kicker. For the final 3 LSU plays and game-winning FG, start at 40:33. Eastern Michigan got a first down at the Purdue 5 by running for 10 yards on 3rd-and-5 from the +15, out of timeouts, with 36 seconds remaining. The Eagles then took a knee, spiked the ball with a couple seconds left and kicked the field goal as time expired. Eastern Michigan executed its strategy very well. There were a couple of risks, in that a false start penalty could have ended the game on the spike or the kick could have been missed in the rainy conditions. But running a play and risking a turnover or scoring and giving Purdue a few plays to do something offensively would have been more dangerous than missing what amounted to an extra point. Earlier in the fourth quarter, an interesting two-point strategy scenario developed. After scoring a TD with 6:41 remaining, Purdue held a one-point lead—a clear two-point situation to go up by a FG, given the time. But the Boilermakers picked up a celebration penalty on the TD, which the Eagles wisely applied to the try. Purdue chose to kick and take a two-point lead, which was the last score prior to the game-ending FG. The Purdue decision was very difficult. There are some advantages to being up two versus up one; for example, another TD would put the Boilermakers up nine vs. eight. But being up two vs. one did nothing to protect Purdue from falling behind from a subsequent Eastern Michigan FG. The CAI charts suggest that with five minutes to play, teams should go for two when leading by one even after a 10-plus-yard penalty against them. With 10 minutes to go, the recommendation is to do so after a 5-yard penalty. Because this situation was closer to five minutes, CAI would have leaned toward going for two, but it was a very close call. The clearest message from this situation: Don’t celebrate after TDs and put your team in a terrible spot! For the EMU first down run, spike, and game-winning FG, start at 10:47. Cincinnati had the bold calls of the weekend in their upset win over UCLA. Leading 19-17, the Bearcats faced 4th-and-2 at the UCLA 12, with 2:44 left, and with UCLA down to two timeouts remaining. With the announcers imploring Cincinnati to kick the FG and force UCLA to get a TD to win, the Bearcats kept the offense on the field, and crashed forward for three yards and the first down. On the next set of downs, Cincinnati faced another tough call—4th-and-goal at the +3, with 1:47 remaining in the game, and with UCLA out of timeouts. Initially, Cincinnati brought out the field goal unit, but after an illegal substitution penalty on UCLA, Cincinnati brought the offense back onto the field. The Bearcats were able to convert yet again on 4th-and-goal from the 1.5-yard line to take a commanding 9-point lead. These fourth-down decisions were both bold and excellent decisions by Cincinnati. There was definitely value in making a field goal to go up by 5, and protecting against UCLA being able to take the lead with a field goal of their own (UCLA does have a good kicker). In addition, Cincinnati had some problems in the kicking game earlier in the contest. Though the FG was likely to be made, UCLA would have had plenty of time, all four downs at their disposal, and a TD would probably win them the game. CAI would estimate that UCLA would drive for a winning score around 25% of the time under these circumstances. While the FG did provide some benefit, the value of making the fourth downs was overwhelming, with victory almost certain following the TD to go up by 9. Additionally, even if missed, Cincinnati would not be in bad shape. Consider on the final conversion from the 1.5-yard line. Had this missed, UCLA still would need to drive at least 65 yards from the -1 to get into FG range and then make a kick to take the lead. This situation isn’t that much different than having to drive 75 yards for a TD after a made FG. Given that the expected conversion rate was well over 50% on both of Cincinnati’s fourth-down attempts, going for it was clearly the correct choice. Setting up the Cincinnati touchdown drive, UCLA had faced a 4th-and-1 at the -36 with 5:46 to play, with the Bruins trailing 19-17. UCLA went for it on fourth down, but threw incomplete for a turnover on downs. While the fourth-down play didn’t work, this was absolutely the right call by the Bruins. With time running short, the team might expect to get 1 or 2 more possessions, with the possibility that they don’t see the ball again. With college teams converting 4th-and-1 around 70 percent of the time nationally, UCLA was taking a good risk to take to keep the drive alive. Even after the miss, UCLA would have had a chance to take the lead had they held Cincinnati out of the end zone. For the UCLA incomplete pass on 4th-and-1 with 5:50 left, start at 1:59:41. For the first Cincinnati fourth down conversion with 2:44 left, start at 2:05:07. For the Cincinnati 3rd-and-goal running play and UCLA illegal substitution penalty, start at 2:08:20. For the 4th-and-goal conversion for a TD, start at 2:10:20. Following Grayson’s first touchdown of the game, Tucker committed an encroachment penalty on the extra point, which would have moved Grayson to the 1-yard line. Instead of taking the penalty and going for two, Grayson declined the penalty and then proceeded to miss the extra point kick. CAI would have recommended that Grayson go for two following the penalty as they would have been expected to convert the 2-point conversion roughly 60 percent of the time. Especially at the high school level where kicking extra points is not an automatic point, CAI recommends that teams go for two following penalties, when the odds of converting are in their favor. Following Grayson’s second touchdown, they committed a false start penalty on the extra point and then had a bad snap, leaving GHS ahead 12-0. Given the kicking situation, the recommendation would have been to go for two immediately following the touchdown to try to increase the lead to 14-0. On Grayson’s third touchdown, GHS did go for two and they converted for a 20-0 lead. Grayson went on to win the game 48-7. For the Tucker enchroachment penalty and Grayson missed XP, start at 11:15. For Grayson’s false start penalty and bad snap on the XP, start at 15:12. For Grayson’s successful 2-pt conversion for a 20-0 lead, start at 22:44. 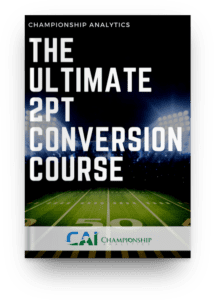 Download the CAI Strategy Academy 2-point conversion cheat sheet today and win more games! Copyright @ Championship Analytics, Inc.